Nope, the install wasn’t that bad. I’m no mechanical, construction or electrical guru (at all) and I knocked it out in less than half a day. But….this was after the minor electrical work was performed by Cedillo Marine (619-496-4116) to get minor power to the out vent fan (or you can use a passive vent) which took less than an hour. Honestly, this is an install most folks on boats should be able to do themselves and Airhead provided good directions with decent pictures. If I can do this….you can do this. 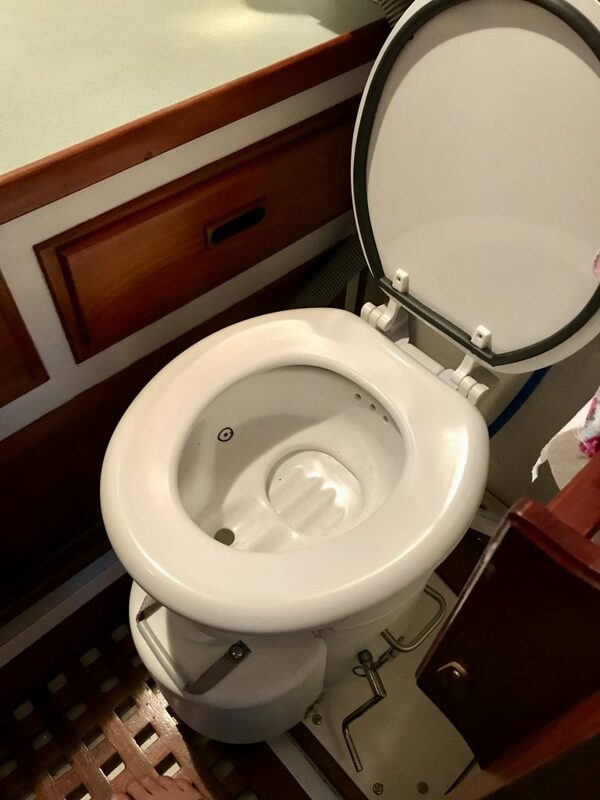 Step 2– Leave the old toilet sitting on the dock while you’re contemplating how you’ll do the install. Step 3– Read the directions from Airhead, gather tools, measure spaces and measure again for the correct installation of the lockdowns. 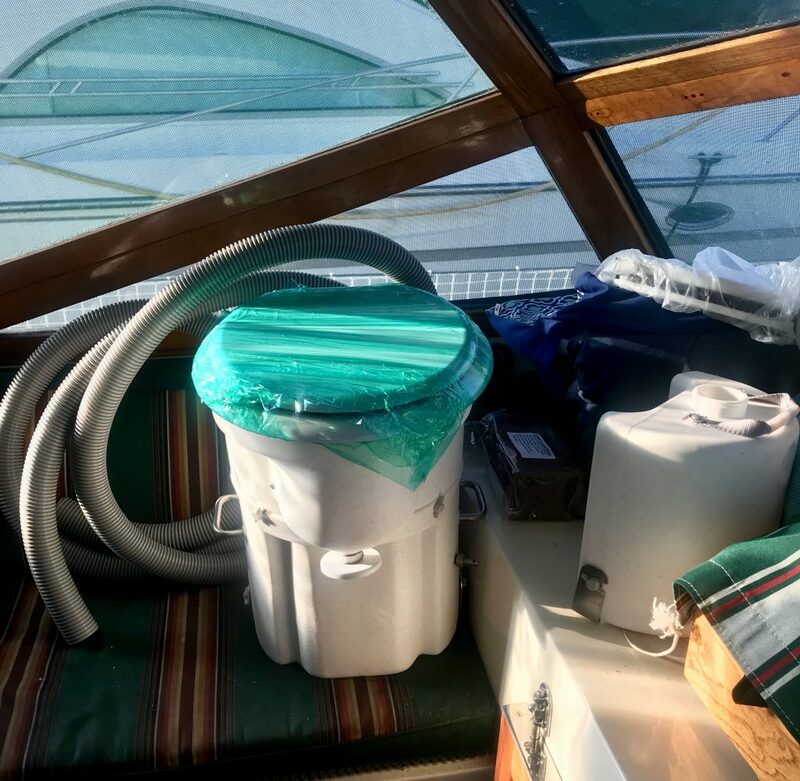 In this picture you see the Airhead toilet, the extra vent hose I bought, the 2-gallon urine bottle and in the upper right, the lid used to keep everything inside the lower unit and out of sight when cleaning or transporting. Step 5– I drilled a hole through the cabin side, put on a large Clamshell on the outside to keep the water out and installed the shroud with the fan on the inside. 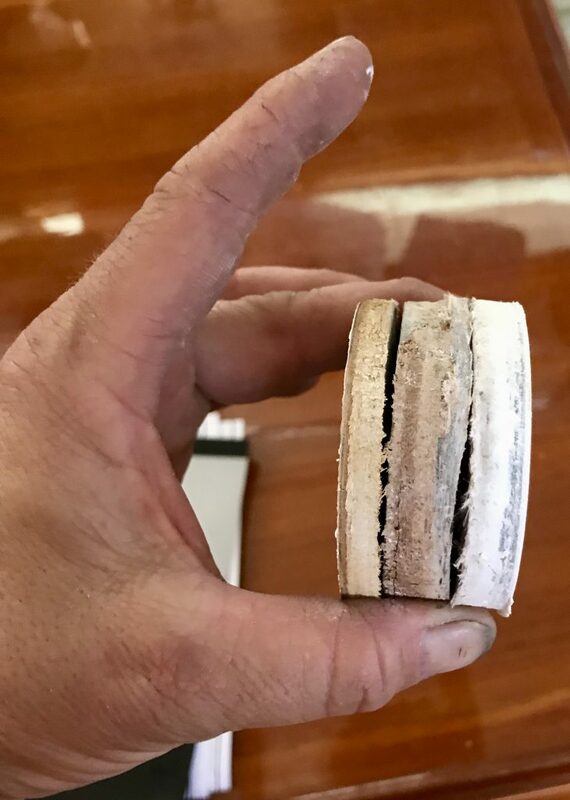 Just an FYI- here’s how thick the side of the cabin was, from inside the head cabin to the outside. In the picture you can see the layers, which are more than 2.5 inches thick. Step 6– Follow the directions to put the hose together and into the toilet, put the toilet onto the base and then install the urine tank. 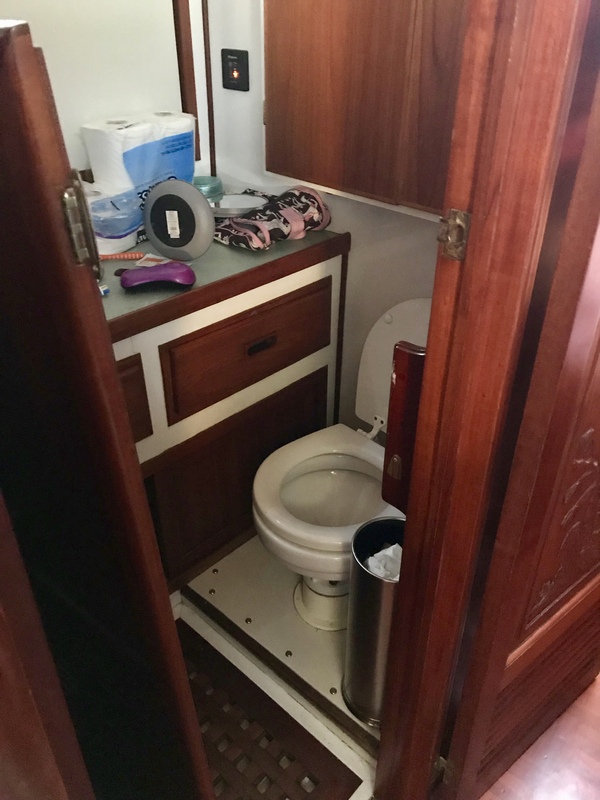 Don’t forget to give the urine tank about two inches to rest on and make sure your door will still shut and the toilet seat will still open. Lastly, do you see the target I put on the left side of the toilet bowl? Airhead actually recommends this point for male aiming (when standing). 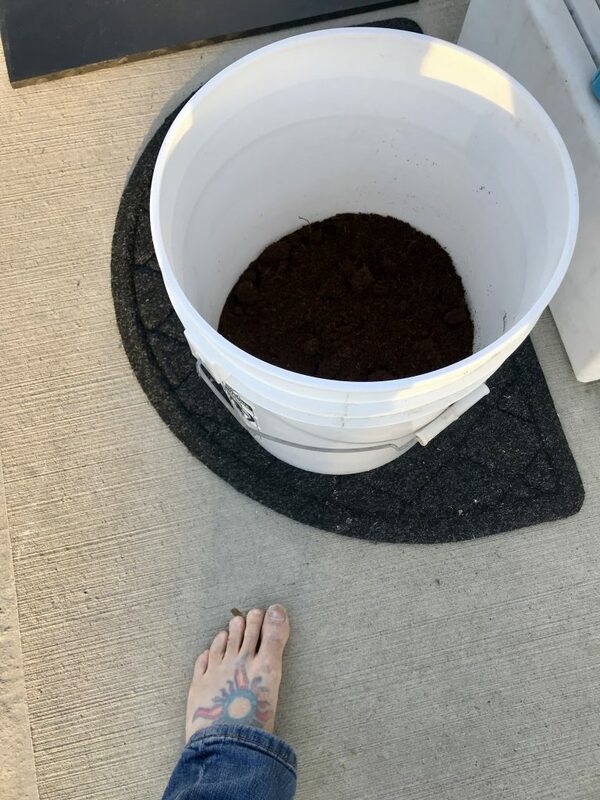 Here’s the Coir Brick inside a bucket. I had followed the directions and put it in a large bag with the recommended amount of water, but it simply broke the bag. It needs 3 hours to absorb the water, so I had started it when I started the head install. Step 7– Coir or other substrate needs to be added to the Airhead, the urine tank attached and you’re done. New Airhead Composting Head in place and ready to use. You can see the hose in this pic going to the shroud, not yet neatly tucked into place but usable. Job Done! Overall this wasn’t that hard of a job, but it took a bit of planning. I recommend you read the tricks and tips in the directions, as I think they’re key to keeping smells and bugs out of the system. 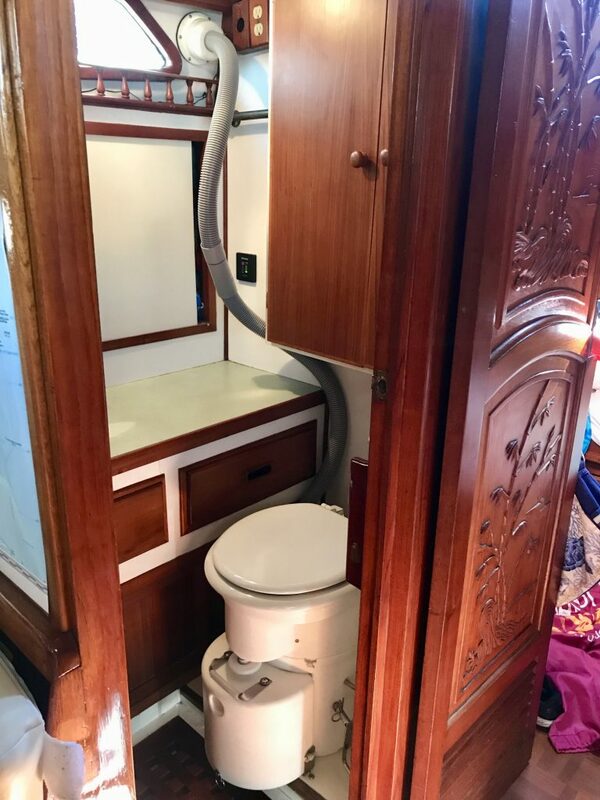 Price for this toilet is higher than most toilets, but I also don’t have to have a tank pumped or emptied anymore at all. 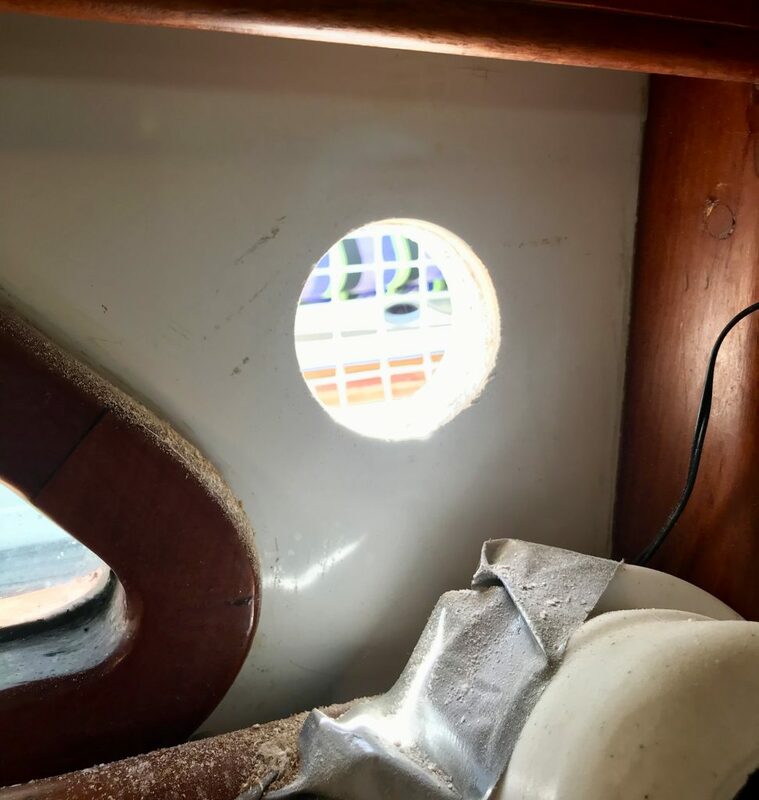 Lastly, I was a bit hesitant to have my saltwater and three-way valve throughhulls “cut and safed” in the boatyard to commit to the system, but after talking to our broker at Yachtfinders and Windseakers we had the work done. 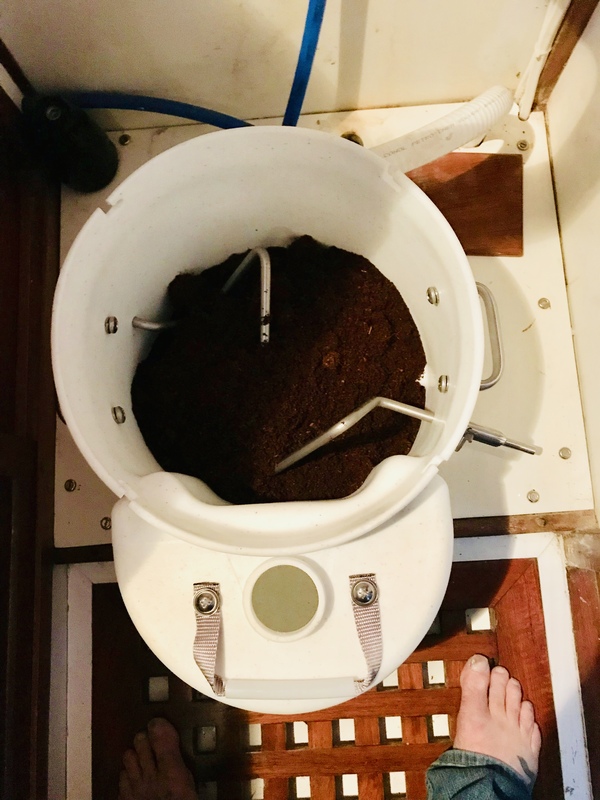 It was made clear that these heads shouldn’t hurt a boat’s value, as composting heads are gaining acceptance with buyers and boating in general. 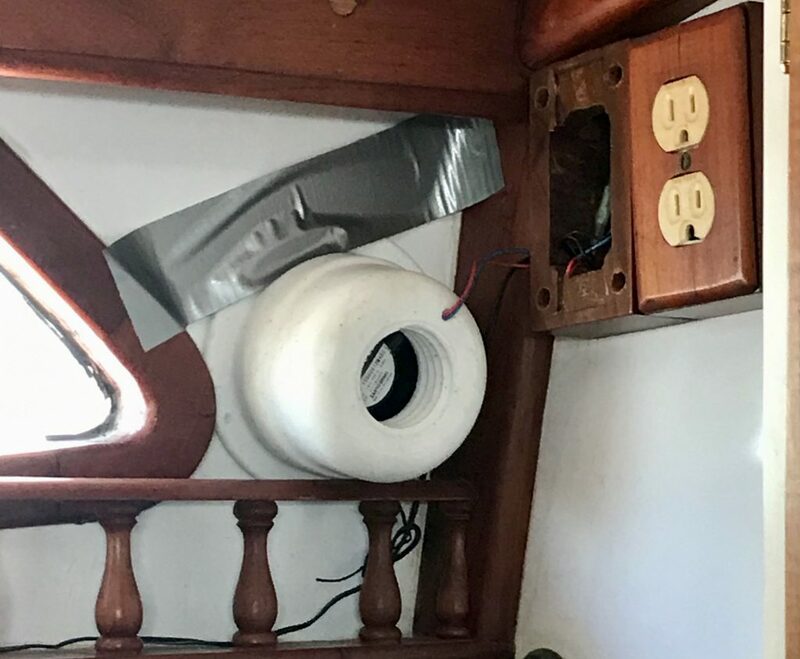 Wanna see video and read another article on Airhead installation from another point of view- check out the story from “Have Wind Will Travel“. 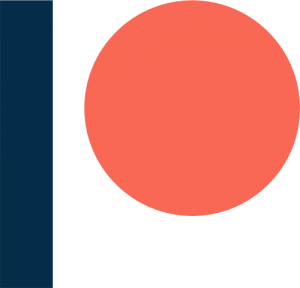 If you liked our story and our style, consider following our blog, our Patreon site or our YouTube site. 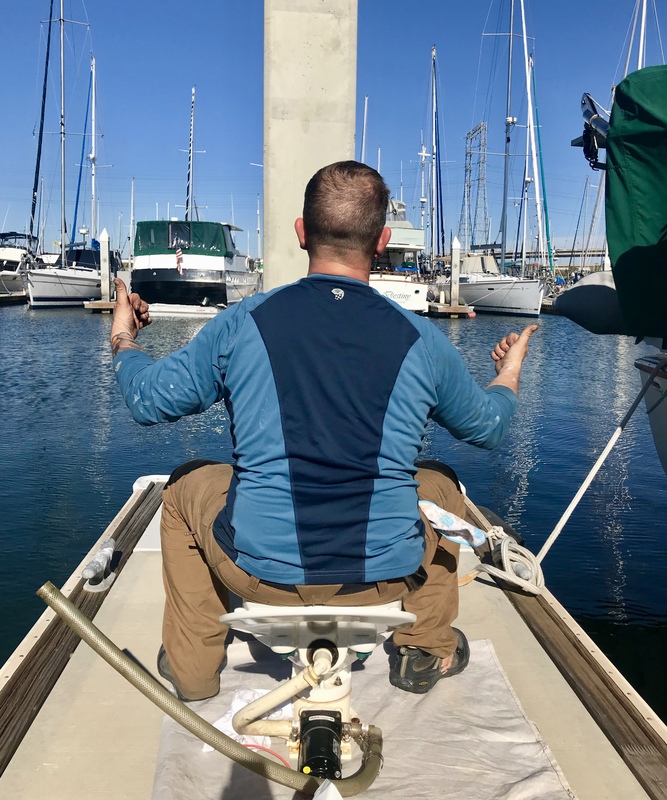 Have a great day, we’ll soon be bringing you video and updated stories from the Pacific Sail and Power Show….woooo hoooo!